Nail art is a type of art in which we paint our nails. It is a creative yet an attractive activity for many girls. Painting finger and toe nails are considered as a popular fashion for many years. Girls and women design their nails with elegant, bold and beautiful colors that are related to their outfits. In the beginning it seemed like its very difficult to apply but now every color and every texture of nail colors are available in cosmetic shops. In latest nail art designs bright, attractive, fancy and elegant colors have been used. Nail art have unique and stunning color patterns. Girls always want to boost up their nails and they try hard for difficult and unique color patterns but most of them fail to do so. 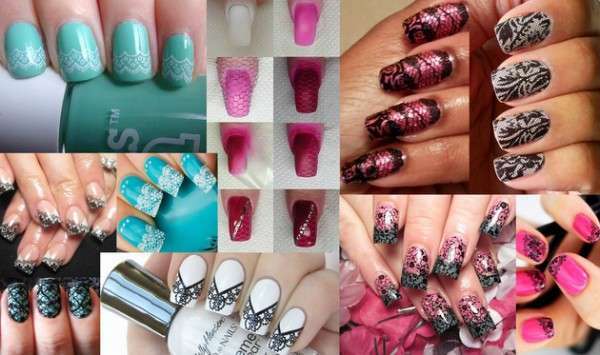 One form of nail art is the Lace Nail Art and today we will be displaying some of the Elegant Lace Nail Art Ideas 2014. Lace nail art is not difficult to apply although its an easiest method to beautify your nails in less time. For this you have to buy decent, pretty and gorgeous laces mostly the net fabric is been used. Today different types of laces are available in market you must try to purchase pretty and attractive one not very over looking. And also try to buy that fabric which suit best with your outfit. 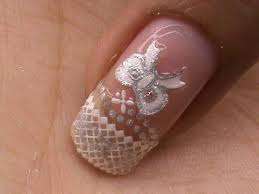 Lace nail art is best for your formal as well as casual functions and it can be applied easily. Firstly you have to apply a nail color on your nails. Nail color must be a beautiful and gorgeous one. Then cut a piece of fabric lace whose color should match with the color of your outfit and it looks best with your nail color too. Take the lace and apply it on your wet nail color. Wait until when your lace and nail color becomes dry. Now your Lace Nail Art is ready in just few minutes. There are few lace nail art designs below, definitely you will find it beautiful and they will enhance your beauty and glamour.